Functional Information: its potential for quantifying biodiversity and its relation to ecosystem functioning. September from 7th to 11th 2015. Leipzig, Germany. This highly interdisciplinary workshop unites knowledge and understanding from information theory, community ecology, and molecular and computational biology. It will be preceded by remotely managed collaboration; hence, its purpose is to consolidate developing ideas. We will explore the use of information theory to address the iDiv theme question of how biodiversity gives rise to ecological function. This will address the complexity of biological systems as dynamic networks, seeking to quantify systemic complexity and explore the potential for complexity metrics to improve understanding of how biodiversity contributes to ecological function. We will focus on “How to scale-up existing information-based measures from the molecular scale to all scales, including that of ecological networks”. The workshop shall examine information-theoretical methods to quantify biodiversity as complexity, in terms of information content, using network models of biological systems at multiple scales of organisation. We will explore ways to measure the contribution of biological complexity to ecosystem function by mapping the state-space of biological-network models in a range of ‘function’ metrics using a case study system to encourage its take-up by empirical scientists. Following the workshop we will apply our developments to estimate the functional information of the case study system and relate this to empirical measures of ecological function to test the value of this concept for practical prioritising of ecosystem attributes in conservation plans. Queen’s University Belfast UK Theoretical Biology: Information and life. National Cancer Institute, Maryland USA. 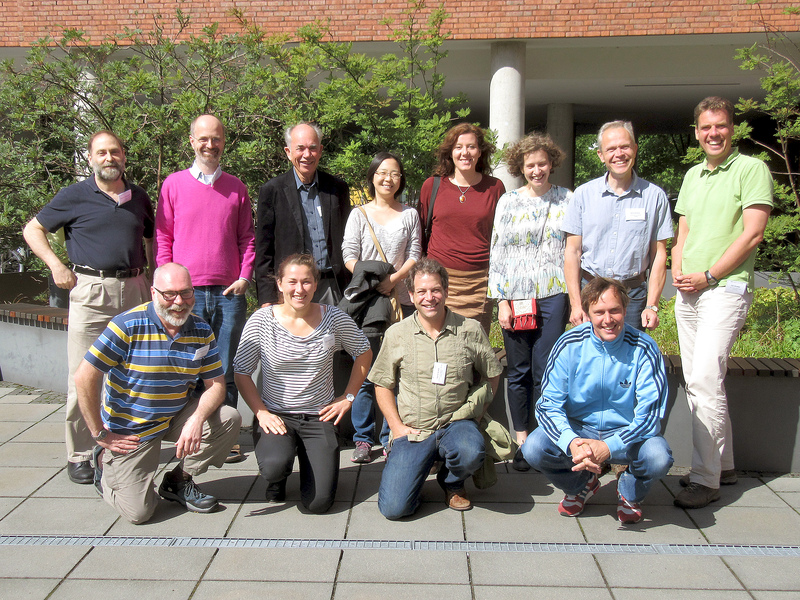 The 'A' team: a happy group photo of sFIND at the German Centre for Integrative Biodiversity Research (iDiv) in Leipzig. front row - Keith Farnsworth, Olga Lyashevska, David Ardell, Lars Gamfeldt. The overall aim is to explore the prospect for the understanding of biodiversity and its role for ecological function, using the information theory currently developed for molecular biology. The focus of the workshop will be examining how we might scale the functional information concepts from molecular to ecological levels of organisation. Its specific aim is to seek a practical measure of FI for a biological system, which we describe generally as a network of interactions. This will provide an important link in the chain that leads from quantifying biodiversity to predicting the resulting ecological function. The workshop will seek to develop a rigorous definition of FI in biological networks and identify the quantifiable characteristics appearing at the molecular scale that can be used at higher network scales. This aim is centred on the overarching iDiv question “How does biodiversity emerge (‘emergence’)?” Since emergence is a property of complex systems and life may be thought of as organised complexity, from which phenomena emerge at several organisational scales to form a nested hierarchy of pattern, the emergence of biodiversity is a consequence of the functional information embodied by this complexity. The idea is that by defining these concepts with mathematical rigour, we may quantify ‘functional’ biodiversity over all scales of biological organisation. The practical outcome will be a general mathematical framework, with appropriate metrics, for describing BEF relations of biological systems. It will partition contributions of functional information from the individual level, and distinctly, from the network complexity. This work will be recorded as a foundational paper, authored by workshop participants. Its conclusions will directly address the second iDiv overarching question “What are the consequences of biodiversity for the functioning of ecosystems (‘consequences’)?”. We will examine whether the concept of biodiversity as functional information clarifies and generalises BEF relations, particularly in relation to ecological network characteristics. Are results from diversity-function experiments valid at larger scales (space and time)? We are looking for general characteristics of biological networks that embody functionality at an extended range of scales. Interpreting FI as a scale-independent metric for biodiversity will enable general predictions about BEF. In particular we will investigate whether new sources of FI emerge at larger scales of organisation,, especially those normally missed by BEF experiments. How can we optimize conservation strategies to safeguard the full range of biological information? Through quantifying biological information, not only within, but among the components of a functioning ecosystem (the network information), we can show the dependence of ecosystem function on the FI embodied at the system level. This plugs a knowledge gap, enabling conservation managers to take account of systemic complexity, in addition to the individual organisms. How and why are different types of diversities (genetic, species, functional, interaction) correlated? Our aim is to unite these by generalising all forms of diversity as cases of functional information. That will enable a quantitative understanding of their inter-relationships. Establish a rigorous definition of functional information for biological networks, spanning molecular biology and ecology, identifying the common features among these different scales of biological organisation (note this may develop throughout the workshop). Identify the quantifiable characteristics of functional information appearing at the scale of molecular networks, and find ways to apply these at the scale of ecological networks. From these quantifiable characteristics, estimate the FI of an ecological network, using worked examples from soil and marine systems as an illustration. As a follow-up, use ecological network scale FI to quantify BEF relations in systematic disassembly simulation experiments, modelled on case-study ecological systems. This objective will be realised through follow-up research projects. 1) Establishment of online research collaboration, with forum and document sharing and agreed scope and overall aims, consistent with the workshop aims and objectives. 2) Review of conceptual and quantitative measures of functional information and diversity at molecular, organism and ecological levels of biological organisation. 3) Selection and description of worked example from soil and marine communities. 4) Agreed plan for multi-disciplinary publication: a synthesis explaining how the concept of functional information is useful in understanding biodiversity and BEF relationships over a range of scales of biological organisation. 5) The workshop (see time-table of events below). 6) Follow-up completion and submission of the multi-author paper and applications for PhD studentships and further grant funding for collaborative research among the group, especially targeting the development of worked examples that use the concepts and methods we develop in the multi-author paper. The workshop will consist of a presentation-discussion-writing cycle, for which participants will have prepared their subject-specific contributions in advance. Participants will synthesise their prepared contributions to form a synthesis document. This document will be the basis for a major cross-discipline paper that states the new interpretation of biodiversity as the biological embodiment of functional information, where the function is ecological function, from which the BEF relationship follows. The workshop will use a case-study ecosystem to illustrate the power of the new synthesis for quantifying biodiversity and its resulting ecological function. This case-study will be supplied by participants with system-specific expertise in soil and marine community structure. The working group will start preparing an outline of the planed publication from the beginning of 2015. This outline will be presented and discussed at the workshop. Preparation documents and discussions will be supported by this website (http://www.whatlifeis.info). After the workshop, the indicated deliverables will be prepared. First drafts of manuscripts are expected by March 2016, submission is anticipated for July 2016.
from molecular to ecological information; in which each participant gives a brief introduction to their perspective. Self-organisation and Shannon applied to biological systems. * Led by does not mean they do all the work, rather it means they are the responsible coordinator for the session. Please let me know if you have better suggestions! This is not fixed in stone and I would rather respond to other people's ideas. Adami, C. Information-Theoretic Considerations Concerning the Origin of Life. (2014). (from arXiv:1409.0590v1). Lizier, J. T. (2014). JIDT: An information-theoretic toolkit for studying the dynamics of complex systems. Frontiers in Robotics and AI 1:11 (from arXiv:1408.3270v2). Lyashevska, O. and Farnsworth, K. D. (2012). How many dimensions of biodiversity do we need? Ecological Indicators. 18:485–492. Schneider, T.D. (2010). 70% efficiency of bistate molecular machines explained by information theory, high dimensional geometry and evolutionary convergence. Nucleic Acids Res. 38, 5995-6006. Walker, S.I. Top-Down Causation and the Rise of Information in the Emergence of Life. (2014). Information. 5, 424-439. I'll add more references and of course, I am open to suggestions.